(SitNews) - November didn't quite feel like a typical November in Alaska, with widespread warmth and mean monthly temperatures of 15 degrees above normal in some places. For many locations, this November ranks in the top 10 warmest on record. Temperatures were given a boost around Thanksgiving, especially in the Interior, courtesy of a Chinook event that resulted in temperatures in the 40s, and some melting of the already meager seasonal snowpack. Precipitation conditions for the month were mixed with some places quite dry and others receiving more than normal for November. Temperatures in Ketchikan were quite close to normal in November, with an average for the month of 38.1 degree Fahrenheit, less than a degree above normal. The average high and low temperatures were 42 degrees Fahrenheit and 34 degrees respectively. The absolute high and low temperatures were 48 degrees on Nov. 10, and 28 degrees on Nov. 19. Liquid water equivalent precipitation totaled 12.14 inches, a few inches below normal, and there were only five completely dry days during the month. No snow data were available for November. Juneau had a dry November that was a bit warmer than normal. Measurable snowfall occurred on only two days during the month for a total of 4.5 inches. However, rain was prevalent, occurring on 18 days during the month. The liquid water equivalent precipitation total was 3.15 inches, about 60 percent of normal for November. Temperatures averaged 34.9 degrees Fahrenheit for the month, a positive departure of 1.6 degrees. Juneau's high of 45 degrees Fahrenheit occurred Nov. 16. The month's low, 19 degrees, occurred on Nov. 30. Heating degree-day units were about 60 less than normal at 896. 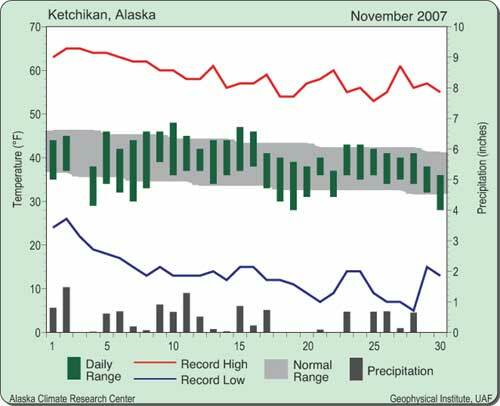 Warm and dry was the story in Fairbanks this November. Only 4.2 inches of snow fell during the month, well below the normal 13.6 inches for November. There were 6 inches of snow on the ground by the start of December. This is well below normal for this time of year. Water equivalent precipitation was 0.11 inch, which is 0.57 inch below normal and ranks as sixth driest on record. Temperatures averaged 11.5 degrees Fahrenheit for the month, a departure of more than 9 degrees from normal. The average high and low was 20 degrees and 3 degrees, respectively, both well above normal. Temperatures on Thanksgiving soared to 43 degrees with a Chinook event. This was the highest temperature for the month and the low was minus 15 degrees Fahrenheit on Nov. 19. With the warmth, heating degree-days were correspondingly below normal at almost 1,600 units, a departure of 285 units. For Big Delta, November brought warm and dry conditions, as was the case for much of the Interior. The mean monthly temperature was about 13 degrees Fahrenheit above average at 19.7 degrees. The average high and low temperatures were 25 degrees and 15 degrees respectively. On Nov. 21 and 19 the high and low for the month of 44 degrees and minus 8 degrees were observed, with the former setting a record high temperature for that date. Heating degree-days were 700 units less than normal, as would be expected with the warmth, at 1,305 units. Liquid water equivalent precipitation totaled 0.21 inch, which is less than half of the normal 0.59 inch for November. No snow data were available for this location. Anchorage residents experienced their fifth warmest November on record. The mean monthly temperature was 8.8 degrees Fahrenheit above normal at 30.6 degrees. The average high for the month was above freezing at 35 degrees, while the average low was about 10 degrees above normal at 26 degrees Fahrenheit. The highest temperature was 46 degrees on Nov. 21, and the lowest was 14 degrees on Nov. 16. Along with the warmth, Anchorage had an above normal snowfall total for the month of 14.8 inches, a departure of 3.4 inches. Due to above-freezing temperatures, the snow that was received around mid-month had melted by the third week, leaving no snow on the ground at the Ted Stevens Anchorage International Airport by the start of December. Liquid water equivalent precipitation was also above average with 1.29 inches. Heating degree-days were about 1,025 units, which is 275 below normal for November. Extreme warmth continued in Barrow for November as residents experienced the third warmest on November record. The average temperature for the month was almost 15 degrees above normal at 13.9 degrees Fahrenheit. The average high and low temperatures were 19 degrees and 9 degrees, while the absolute high and low for the month was 26 degrees on Nov. 24 and minus 14 degrees on Nov. 27. With the warmth, heating degree-days were well below normal at about 1,525 units. Snowfall totaled 14.4 inches for the month, above the normal 3.2 inches. Accordingly, liquid water equivalent precipitation was 0.47inch, a positive departure of 0.31 inch. Ten inches of snow were on the ground at the airport by the start of December. Sea ice was not to be found off the coast going into December, which is a first according to local residents. Nome had a warmer than normal November this year, with an average temperature that was 4.7 degrees Fahrenheit above normal at 21.6 degrees. Most of the extremely warm days occurred during the last week of the month. High temperatures averaged 28 degrees Fahrenheit, while low temperatures averaged 16 degrees. On the Nov. 30, the monthly high temperature of 38 degrees Fahrenheit was observed, while on Nov. 20, the low of minus 6 degrees Fahrenheit was recorded. Along with the warmth, came a below average heating degree-day total, 1,290 units. Snowfall totaled 8.7 inches for the month, down from the normal 13.5 inches for November. A mere 3 inches were on the ground at the airport by the start of December, thanks to some melting and above freezing temperatures. Liquid water equivalent precipitation was 1.33 inches, slightly above average. King Salmon experienced its fourth warmest November on record, with a mean temperature of 31.4 degrees Fahrenheit, which is about 8 degrees above average. Temperatures during all but the third week were well above normal. A record high temperature of 50 degrees occurred on Nov. 30, which was also the monthly high. The monthly low was minus 2 degrees, and occurred on Nov. 18. The average high and low temperatures were 37 degrees and 26 degrees respectively. Snowfall was about half of normal at 3.8 inches and no snow was on the ground by month's end. Liquid water equivalent precipitation was 1.08 inches, which is below the normal 1.54 inches. This information consists of preliminary climatological data that was compiled at the Alaska Climate Research Center, Geophysical Institute, University of Alaska Fairbanks.